RPA is recognised for its world class teaching and research. Our strengths include premier research groups, including biomedical research, clinical research, public and population health research and health services research. The research findings from studies at RPA are widely published in medical literature. In 2009 there were 585 peer-reviewed publications by our staff, and in 2010 another 527 peer- reviewed articles were published. Many of these findings are presented at national and international meetings. Staff were invited to present papers on 542 occasions in 2009 and 2010. A number of medical, nursing, scientific and allied health staff were recipients of awards from national bodies in 2009 and 2010. Each year, Royal Prince Alfred Hospital awards the RPA Foundation Research Medal. $50,000 is granted to support ongoing research. In close proximity to the RPA campus there are a number of internationally renowned medical and health research centres which have strong links to RPA and at which many of its senior researchers conduct their laboratory work, or more intensive research. In addition there are many schools and faculties at the University of Sydney. 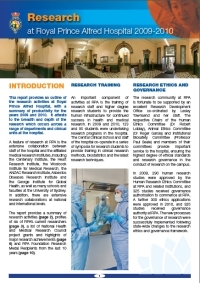 RPA is also proud to be part of Sydney Research - a collaboration of research efforts in the Sydney District.